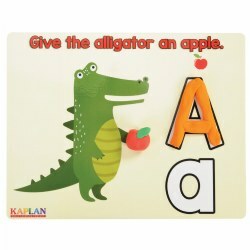 Promote phonemic awareness through Kaplan's selection of educational games. 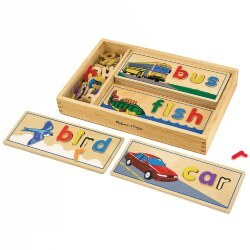 Products include rhyming word puzzles, word chunk cards, word family kits, articulation objects, and much more. 3 years & up. Develop letter recognition and build fine-motor skills at the same time with this fun floor puzzle! Learning the ABC's will be F-U-N with these whimsical letters and colorful, real-life photos. 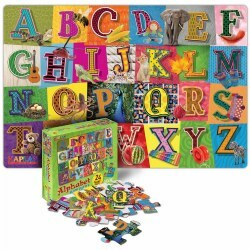 Children will love the up-close, vivid images representing all the letters of the alphabet. This large 24-piece real photo puzzle is made of extra-thick durable cardboard with a wipe-clean surface. Puzzle insert included. Measures 24" x 36". Made in the USA. Grades K - 3. 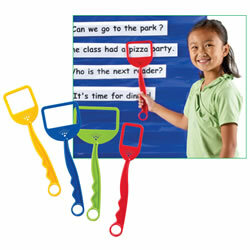 Matching provides an effective way to develop and improve student's reading and language skills. 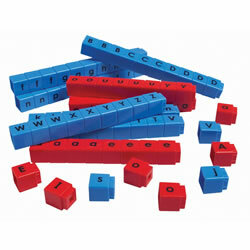 The heavy cardboard stock make these a long lasting classroom favorite. 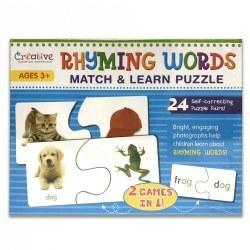 Includes 30 puzzles measuring 4 1/2" x 3 3/4". 3 years & up. Learn letters and vocabulary with acorns! Match uppercase and lowercase letters and match color-coded figures to their appropriate beginning letter. 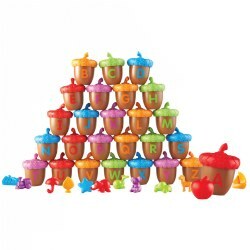 Includes 26 two-piece acorns and 26 color-coded figures—1 for each letter! Acorns measure 2"L x 2 1/2"H.
Grades 1 & up. Literacy practice that students will love! Pull out a popcorn piece and create a word with that ending. A POP kernel means all your pieces go back! 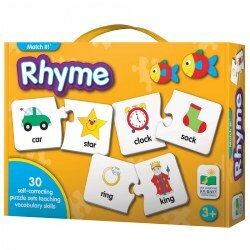 Start with 2-letter endings, then move up to 3-letter endings and rhyming practice. 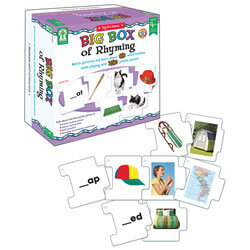 Includes 92 word family cards, 8 POP cards, spinner and guide (printed on box). Measures 3"L x 3"W x 6 1/4"H. For 2 - 4 players. Grades 1 & up. Fun theme engages even reluctant readers! 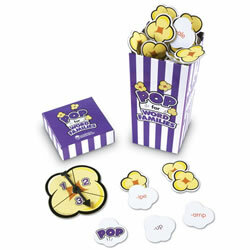 Grab a popcorn piece and build a word with that beginning blend or digraph. Pull out a POP kernel, and all your pieces go back! Includes 92 blend cards, 8 POP cards, spinner and guide (printed on box). Measures 3"L x 3"W x 6 1/4"H. For 2 - 4 players. 4 years & up. 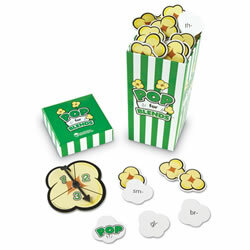 Have a blast reinforcing phonological awareness! Place a photo card in the rocket doorway, and then sort cards that rhyme into the correct rocket. Sort by beginning and ending sounds, syllables and more. 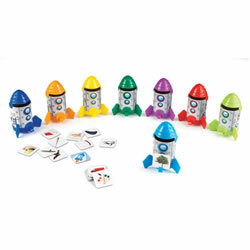 Includes 8 rockets, 80 real-life photo cards, and activity guide. Rockets measure 5"H x 2.25" in diameter. Grades K & up. 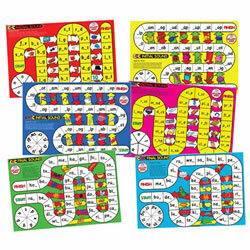 These six board games teach letter-sound correspondence and early word building using three and four letter words with a focus on initial sounds, medial sounds, and final sounds. 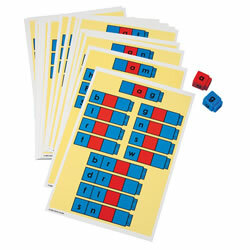 Ideal for small groups, each game reinforces phonemic awareness skills of isolating, blending, and segmenting. Six games on heavy cardboard complete with spinners, dice, counters and answer cards! Game boards are 11" x 17". 4 years & up. 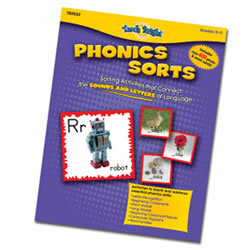 Includes over 400 colorful photo, word and letter sorting cards plus a 16-page teacher resource guide. Skills include letter recognition, beginning consonants, long & short vowels, beginning consonant blends, consonant blends, consonant digraphs, and word families. 3 years & up. 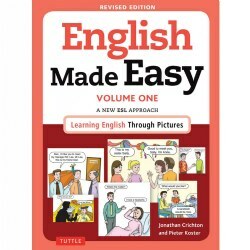 These self-correcting puzzles have real-life pictures with the associated word underneath. Flip the pieces over and the associate word only is on the back for more advanced game play for 2 games in one. 4 years & up. Complete a puzzle to spell a word! More than 60 colorful wooden letters fit into the eight 2-sided cutout boards to spell 3- and 4-letter words. Wooden storage case included.